I don’t really care for fast-action rods, even though I understand that they do serve a purpose. Over the years I’ve gone out on a limb on only very few occasions, stating that a particular fly rod leaves little-to-nothing to be desired: the Winston Boron IIIx is one of those rods. Let’s get straight to it. Winston designates the Boron IIIx as a fast rod, and it is: the new, third-generation boron formula amps up the blank considerably – something many were grumbling about on the release of the IIx. Winston listened, and handily settled that issue. The Boron IIIx now has power to spare. Paradoxically, it’s also a fast rod that flexes deep – making it ideal for tandem rigs, exact presentation and, predictably, casting to fish that are far away. The Boron IIIx is well balanced: it feels good in hand, casts buttery smooth, and as a result delivers five-star accuracy. How a rod fishes is other half of the equation. The IIIx blank is very sensitive, and displays no noticeable transition between the tip and mid sections. Anyone used to fishing ultra-rigid graphite rods might initially feel the Boron IIIx doesn’t quite stack up in the power department, but a minor tweak to your cast inflection and timing will lay that issue to rest. In fact, my favourite Boron IIIx feature is its ability to put the brakes on a fish. While I don’t encourage actual attempts to break a fly rod, the 5-weight that I tested left me open-mouthed when taming an unexpectedly large fish. The #5 blank responded exceedingly well to this super-fish, which made me wonder what could be accomplished with a 7- or 8-weight version. I saved the big news for last – the Boron IIIx partnered well with every fly line I tested: light (LT) lines, regularly calibrated lines, and half-size (GVX, etc) heavier lines. This rod is a chameleon, and I can’t recall any rod that I’ve ever tested that partnered so well with such a wide array of fly lines. It’s something quite astounding, when you pause to consider it. 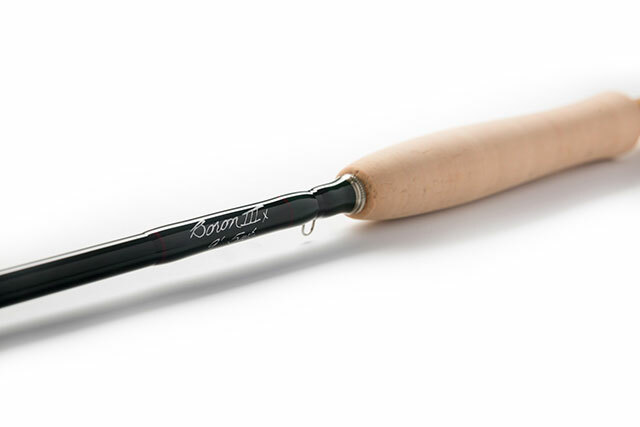 Craftsmanship on Boron IIIx rods is Winston grade, which is to say top-tier. This is a rod that stands alone in its class: it has minimal swing weight, is accurate at all distances and features a long list of notable hardware (like ultra-hard, friction-free shooting guides), that will attract those looking for a unique, high-performance rod. Hands down it’s one of the best trout rods currently available.